As you can imagine, Google spends too much time debunking false and misunderstood information on how Google works. We covered one this morning on email marketing's effect on rankings. To be honest, we have posted some things in the seven plus years on writing on search that Google was upset with. It happens, Google has a PR team to deal with it and Matt Cutts, amongst other Google engineers, are frequently debunking false information. 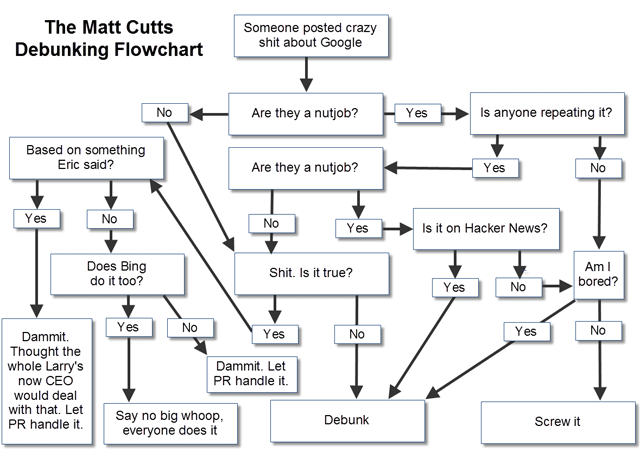 Danny Sullivan put together an outstanding chart named The Matt Cutts Debunking Flowchart. It is a somewhat humorous but sometimes true flowchart of how Matt and his team decide when to debunk this information. From conspiracy theories to just wrong information, to making Google look better when they really are somewhat wrong. The large flowchart is at Search Engine Land, but here is a smaller sized version. There was an SEO blog that had a headline "Google Copying Bing's Image Results? Google Cheating Bing?" at https://www.seroundtable.com/google-indexing-bing-13477.html when in fact it was just images on bing.net and Bing neglected to have a robots.txt file. We have a policy against search results in search results, so we were happy to remove the images in less than a day. The SEO blogger changed the headline to be less sensational. Oh, one more debunk: http://allthingsd.com/20110527/google-no-government-investig... The webspam team continues to take manual action to remove spam in the same way that we have for the last decade. Those are the four debunks that come to mind from the last week or so. Sigh. Of course I take a little issue with my story but I won't argue here. The chart is fun and I can totally relate to this on a much smaller scale. Forum discussion at Sphinn and HackerNews.